A true ball mill is a porcelain jar partly filled with spherical or rounded cylindrical porcelain balls. Industrial versions are made of metal and have porcelain linings. 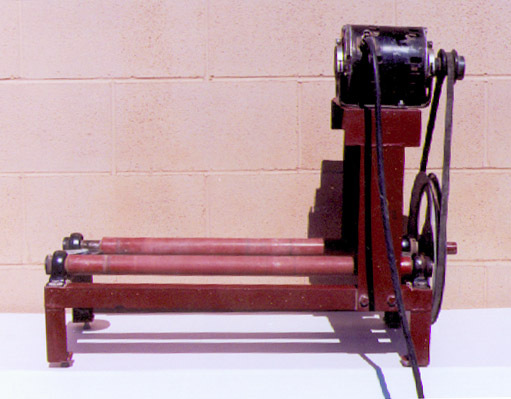 Small scale operations most commonly employ ball mills for grinding glazes. The suspension is poured in, a lid secured, and it is rotated on a motorized rack, sometimes for many hours. The tumbling balls within grind particles smaller and smaller as they impact each other (and crush particles that happen to be at the points of contact). The creamier glaze that milling produces applies better, has more stable viscosity, fires more consistently and cleaner with less specks and imperfections (eg. pinholes and blisters), and melts better. Glazes can be overmilled, this can produce solubility, crawling, opacification and slurry issues (since certain materials in the glaze need to be kept above a certain particle size to behave correctly). Potters and hobbyists are generally not aware of the importance of the ball mill to industrial ceramic ware production. For a small-scale stoneware operation it is possible to survive without one using a narrow range of glazes and techniques. But when production is ramped up consistency, reliability of the glaze appearance and defect free ware become paramount. Many materials in ceramics are simply not ground fine enough for glazes (they produce fired specks or defects related to expulsion of gases around larger particles); ball, native and slip clays are an example. In other materials fine particles agglomerate into larger ones (e.g. barium carbonate, tin oxide, wollastonite). Others are supplied as a grain-type material rather than a powder and obviously have to be milled (eg. lithium carbonate, alumina hydrate). Engobes that must be sprayed, sink screened or even inkjet printed must be ball milled or nozzles will clog and screen will blind. Obviously, bottled engobes and glazes that potter's buy are ball milled when produced. Amazingly, many industries routinely grind their body materials in ball mills (e.g. the insulator and even tile industries). One Kalemaden plant we visited in Canakkale, Turkey (one of the largest in the world) airfloats and mills local clays for all their products. They even collect their own flint rocks and break and mill them to round. Companies may be seeking residues of less than 0.1% on 325 mesh. Other benefits also ensue, including more plasticity, better fired maturity and strength. The benefits are not only very high quality and defect defect-free products, but better consistency. Typically a slurry of 65% clay and 35% water is made (only possible if deflocculated) and ball milled, then dewatered (using filter presses, spray driers, etc) to make powder or pellets. In addition, materials will melt or go into solution in the melting glaze significantly better or sooner if they are ground finer. Ball mill jars need to be heavy and thick to withstand use. They are expensive, a 1 gallon jar typically costs about $100 US. These jars are not easy to make. They must have a water tight lid and be a true cylinder (or they won't rotate without jumping on the rack). Jars are not glazed on the inside. Lighter duty jars are best made by casting a low shrinkage porcelain. Heavy duty ones must be made using some type of turning process that produces an accurately vertical and round sidewall. It would be extremely difficult or maybe impossible to dry and fire a suitable thick jar made by throwing a cylinder shape from a plastic porcelain. Plastic jars are an option for studio use. The grinding action between the jar walls and balls is lost but the balls will still crush the particles between them if you mill for longer periods. Plastic mill jars also run much quieter. Typically small jars have a range of ball diameters from 1-4 cm. The pebbles cost about $6 US per pound and you need about 8-10 lbs for a 1 gallon jar. Or you google the booklet "Thoroughly Modern Milling" by Steve Harrison (it is intended to assist the potter in building a ball mill with a roller mechanism to handle a jar in the 3 to 5 gallon range). The text describes how to assemble the parts illustrated in the detail drawings and briefly describes making your own jar and ball from porcelain clay body. A4 size, 6 pages of text and 6 x A3 pages of detail mechanical drawings. There is one color photograph. If you are using a ball mill in your operation resist the temptation to think that using one is just a matter of throwing in some pebbles, pouring in the glaze, and turning it on for an hour or so. As a general rule you should mill for the same amount of time, fill the jar to the same level, use the same charge of pebbles and the range of sizes of the pebbles should be controlled (the pebbles wear down over time). There are many finer points to know about using ball mills and industry uses the term "mill practice" to embody them. Variation caused by poor mill practice can create a number of significant fired glaze faults and affect slurry and application properties. To learn more check the book 'Ceramics Glaze Technology'. You should be able to find a copy at one of the used ceramic book vendors or information online.